Clueless is a 1990s cult classic. If you haven't seen it, I encourage you to watch it as soon as you can. It's one of my top favorite movies ever; I've mentioned it a couple times: Halloween Costume Idea & Girls Night Films to Watch on Netflix. There are so many wonderful & memorable outfits from the film, & they'll leave you lusting for your own version. 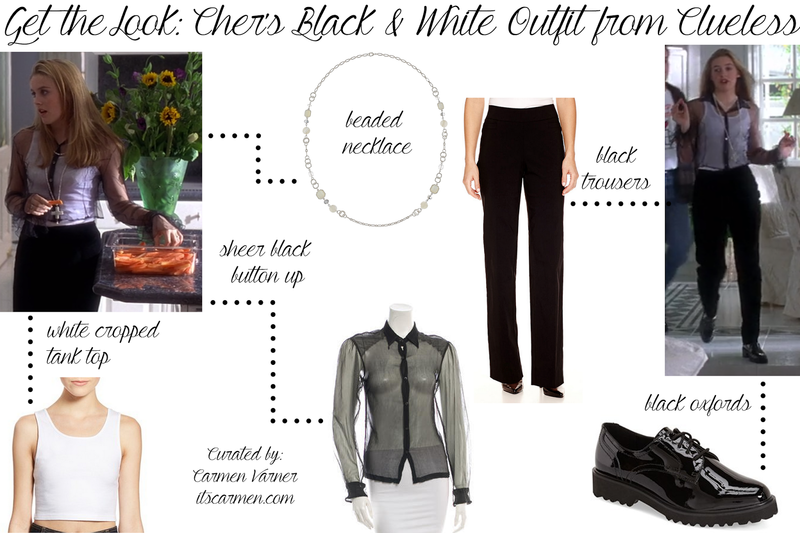 I want to highlight Cher's black & white look from the beginning of the film because it's simple, approachable, & easy to recreate. The best part is you may have most of these items in your wardrobe. They're wearable & versatile garments you can utilize over & over. The first thing you'll need is a sheer black button up shirt with a white cropped tank top underneath. It's easy, breezy, beautiful. Cher's sheer shirt has ruffled cuffs so you can keep that in mind if you want to be authentic. But you go could for a white tank with a black/sheer shirt. The next thing you'll need is a pair of black trousers. Most of us probably already have these for formal days, job interviews, work, whatever. They are sleek & the perfect way to wear pants. Cher's trousers are slightly baggier, but I prefer something more fitted. It's the ideal way to modernize a 90s inspired outfit. Oxford shoes are having a huge come back. They're all over the place & they are pretty easy to find. You may want to go for a pair of shiny, chunky oxford shoes. They are nearly identical to the ones that you could see Cher wearing in Clueless. In the film, Cher wears a choker necklace, a beaded cross necklace, & a simple ring. Keep the look clean & elegant with a darling beaded necklace. A beaded necklace can be used in a myriad of ways so you won't be left owning something that you never use. Clueless has so many awesome outfits it's hard to ignore. Try to pull together this look with items you have in your closet. See how close you can get to the original & then you can integrate a couple pieces from your own wardrobe. I love clueless! Takes me back. Loved her clothes in the movie and her CLOSET! This actually made my day oh my gosh! Best. Movie. Ever. Cher has been my style inspo since I first saw Clueless! Love this outfit post. I love this! Clueless was one of my favorite movies growing up! This is pretty much my favourite outfit from the whole film and I love the way you've recreated it. You're right as well, the pieces are all so versatile. I am a huge fan of black & white outfits! So I absolutely love it! LOVE that movie!! Great inspiration! Love this outfit! It's such a perfect outfit to wear anywhere! I never even realized that I have everything in my closet to make it until this post, so thank you! Absolutely love Clueless!! I love that the 90s have made their way back around!